Squirrel 2 is a budget/account tracking app. The budget you have is represented by a bar that fills up as you add your payments to it. Squirrel 2 is brought to us from Axel Péju on the iPhone and iPod touch for $2.99. This app is a utility to help you keep track of your spending. The main attraction for me is its bar-graph system. Let’s say your general spending budget is $500 per week. You get an empty bar that will fill up as you add to the expense you make. When you take a quick look, it can graphically tell you that you are about to break your own budget. Here’s my experience with this app. I have no idea how to get it working. There are no interface tutorials, no idea if the numbers I’m entering are what I paid or what I currently have, and I have no idea how to make the budget tool work for me. I can set up empty bars, but I can’t find any way to get the bar to increase or decrease. It might be because I’ve never used the Mac version of Squirrel, it might be because the interface doesn’t directly inform you on what the buttons do. I tried the support site off the AppStore, but that led me to a tutorial on Squirrel for the Mac. This is not the app for me. After some more use, you can keep track of your budget by using the Accounts system by adding spendings and transactions manually. 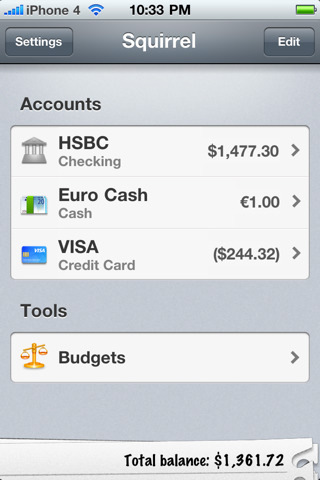 When the payment amount is in the negatives, it is put into parenthesis. If you are plotting your own budget and you know for sure how you want to manage your spending, this would be a nice way to deal with it, but for myself, I have a wallet filled with a certain amount of cash, I have an online account management with my bank, and I have a check book that I keep up to date. I have no idea why how this app would have improved my budgeting. While this isn’t the app for me, but this could very well help you. If you know for sure that this is the app for you, then pay the $2.99 and check this app out. I wasn’t able to fully understand this app and I really wished for a tutorial or interface preview so I’d know what this app could fully do. The app does have a sleek, clean design though. 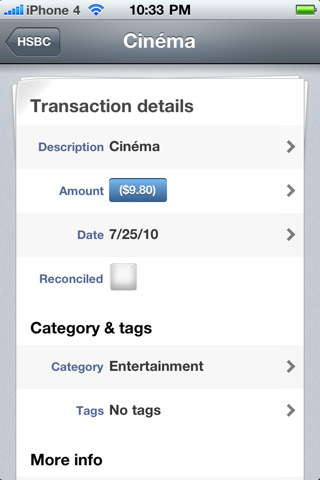 AppSafari review of Squirrel 2 was written by Joseph Ho on September 1st, 2010 and categorized under App Store, Finance, Utilities. Page viewed 5943 times, 1 so far today. Need help on using these apps? Please read the Help Page.